Melanie and Dorothy are chatting about the hen party. Dorothy's friend Winnie apparently went to a party with some spectacular entertainment recently and she's going to try to book the same act for Helen's hen party. 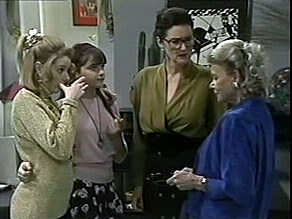 Before she can tell Melanie what it is, Helen comes over, so they put on their innocent faces. Gemma has had a phone interview for the job in Newcastle and they've offers her a two month trial. She can study at the University part-time and it's exactly what she wants. But she doesn't feel she can leave Madge and Harold at this time. Madge assures them they'll be fine. Todd is depressed because Cody is leaving. Helen tells him that it's a very difficult decision for Cody and advises him to just tell Cody how he feels. Lucy rushes in having overslept (despite Helen calling her four times!) Todd has decided to ask Emma out since Cody is apparently seeing Darren, but Helen thinks he's being very unfair to Cody. Gemma has come to see Harold. He asks how Madge is coping at home. 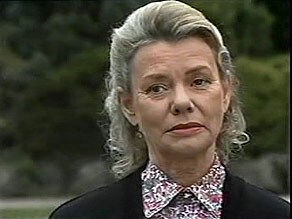 After a while, Madge comes over and says that the doctors are very pleased with Harold's progress. 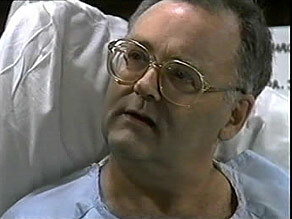 They chat about Gemma's job and Harold tells her that she must go to Newcastle. Emma has come round and has decided to go out with Todd and Josh tonight because Lucy is off to Helen's hen party. She chats to Todd and Todd tells her that he's split up with Cody. Dorothy has come to visit Harold. 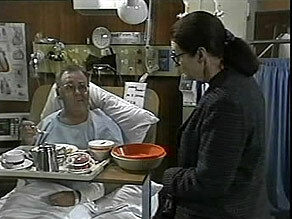 He's struggling to eat the hospital food which is pretty much inedible(!) They chat about Harold's near-death experience. He went down the long tunnel with the light at the end but decided to come back. But it was such a feeling of security and happiness - he'll never be scared of death again. Todd, Josh and Emma are looking through the paper in search of something to do. Todd answers the phone - it's Josh's boss Vanessa. Todd suggests to Emma that they go to the B Block cafe, but Josh can't come - he's got to work. TODD: Well, just you and me then! Josh is panicking - he's been specifically requested to do Helen's hen night. Melanie tells him that no-one will recognise him - he'll have a helmet on after all, and besides, no-one will be expecting him. JOSH: It'll be the quickest performance in strip history! People are arriving for Helen's hen night. Gemma comes in and tells them that she'll be catching the bus to Newcastle tonight to start her new job. 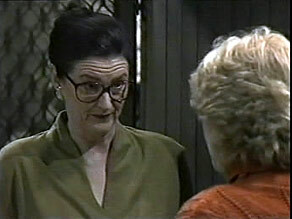 Helen tells Dorothy that Madge isn't coming to the hen night - she doesn't feel up to it. Adam is waiting for Gemma to come back. He's very depressed that she's going to Newcastle. He'll try to visit her at weekends, but he is very busy with his studies. Finally Gemma comes in. GEMMA: You and Uncle Harold have been so good to me. I'm going to miss you. Adam and Gemma head off to the bus. Dorothy has come charging around to make Madge comes to Helen's hen party. She's very upset about Gemma, but Dorothy says the best way to get over it is to get out and enjoy herself. Finally she uses a bit of reverse psychology and calls Madge a wimp. MADGE: I'll be ready in ten minutes! Emma and Todd are back from the cafe. They have had a great time and decide to watch a video. They end up having a bit of a pash. Madge has arrived at the party. Cody is looking forward to going to America and seeing Melissa too, but she's sad about Todd. Just then, there's a knock at the door and they make Helen answer it. It's Josh the gladiator. They all laugh and joke as Josh starts his dance and strip! Adam and Gemma are saying goodbye. They agree not to let the distance spoil their relationship. ADAM: Oh, Gem. I love you. GEMMA: I love you too. They have a last kiss, then Gemma gets on the bus. They wave to each other sadly as the bus drives off. Josh is down to his loincloth and helmet as the dance ends. Lucy starts clamouring for him to take his helmet off. Melanie tries to intervene, but Caroline come up behind Josh and whips his helmet off. They all look shocked.